Release Date: November 10th, 2006 by Columbia Pictures. The Cast: Will Ferrell, Maggie Gyllenhaal, Dustin Hoffman, Queen Latifah, Emma Thompson, Tony Hale, Tom Hulce, Linda Hunt. BASIC PREMISE: Harold Crick (Ferrell), an IRS auditor, mysteriously hears the voice of a burned-out writer, Karen Eiffel, (Thompson) who refers to him as a character in her new book and plans to kill him. ENTERTAINMENT VALUE: This wildly imaginative, refreshing film has plenty of surprises. The first act begins with a narration by Karen Eiffel who types away in her typewriter that a watch saved Harold Crick’s life. Will Ferrell proves he can handle a dramatic role as Harold, an IRS auditor who leads a lonely, mundane life and obsessively relies on numbers for everything. He even counts the strokes when he brushes his teeth and how many steps he takes to the bus station. One day, while brushing his teeth, he hears the voice of Karen Eiffel narrating about him as if he were a character in her book, although he doesn’t know who she is—yet. Without providing any details, the narrator talks about her plans to kill him. He freaks out and briefly sees a therapist (Hunt) who claims that he must be schizophrenic and refers him to a professor of literature, Jules Hilbert (Hoffman) who helps him figure out his bizarre condition. Soon enough, he develops a sweet romance with Ana Pascal (Gyllenhaal), a baker who he happens to audit. What makes this film so engrossing is not just the imaginative, suspenseful plot, but also the well-written, complex screenplay by Zach Helm. Many characters are fully developed enough so that they come to life—even Jules Hilbert who moonlights as a lifeguard. The script also has plenty of humor and wit, especially in the exchanges between Jules and Harold. Director Mark Forster allows every actor to shine and does a masterful job behind the camera with exquisite cinematography, stylish set designs, a terrific musical score, and even some lively animation on occasion. 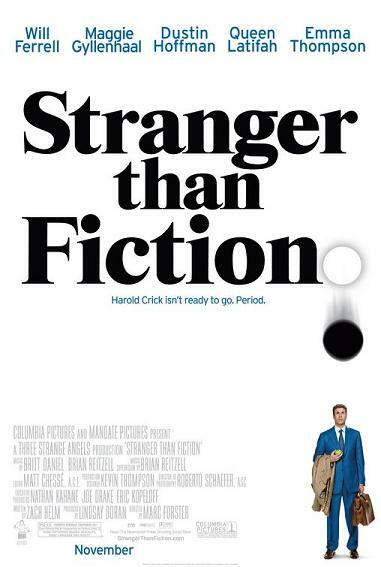 Stranger Than Fiction is just as brilliantly memorable and wildly refreshing as The Science of Sleep. SPIRITUAL VALUE: The plot itself raises the issue that life often imitates art and vice versa. Ultimately, Stranger Than Fiction will force you to think about the purpose of your own life and to reevaluate each moment. Most importantly, it’ll remind you that you yourself have the power to change your life for the better which would help you to lead a happier, less mundane one and, in turn, to embrace life. IN A NUTSHELL: Brilliant. A wildly refreshing, well-acted, imaginative and profound film.